Until recently, any 'scent' of political programming was prohibited at Bar Ilan. Now, students seek to return Jewish, Zionist values. 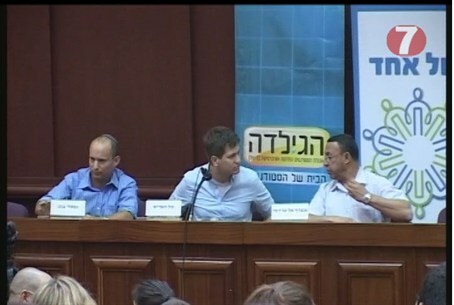 On Monday, Bar Ilan University held a debate between Naftali Bennett, former director of the Yesha Council and Ashraf Al-Ajrami, former PA Minister of Prisoner Affairs. Since the assassination of Prime Minister Yitzchak Rabin, it has been prohibited to hold activities on university grounds that had “any scent” of political activism, Liron Politzer, Chair of the Bar Ilan University Student Union, told Arutz 7. Akiva Lamm, of the Lavi- Gilad student organization, said the group recently decided to protest the Student Union’s cooperation with the ‘One Voice’ organization leading to their inviting Ashraf Al-Airami to speak at campus. Ashraf has previously encouraged and provoked the abduction of Israeli soldiers. This is something, even under the guidelines of freedom of speech, that should not be discussed, Lamm asserted. “He did it under severe pressure from president Obama. The way to overcome it is not to be silent but to step up and begin applying Israeli law in Judea and Samaria,” he asserted.